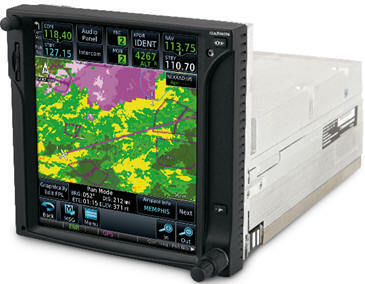 July 19, 2012 - Garmin announced expanded capabilities for the GTN series touchscreen avionics. The new features include display support for weather radar, advanced ADS-B capabilities, worldwide connectivity, cross fill with the GNS 430W/530W series and more. “The GTN series were designed with a growth-oriented architecture that allows for new technologies and expanded capabilities to be accommodated via software updates,” said Carl Wolf, Garmin’s vice president of aviation sales and marketing. For onboard weather surveillance, the larger-format GTN 750 series navigators can double as a panel display for Garmin’s GWX 68 or the new solid-state, Doppler-capable GWX 70 digital weather radars. The touchscreen platform of the GTN 750 makes weather radar a whole new experience. Adjusting the tilt or sector scan is as easy as a swipe of the finger across the display. Pilots can easily overlay the weather radar right on the moving map page, for increased situational awareness. ARINC 708 interface support for other popular GA radars is also optionally available including configurations for the Bendix/King RDR series ART 2000, as well as the RS-181A and RS-811A sensors used on the RDS 81/82 series. When the GTN is paired with a GDL 88 series ADS-B datalink, pilots will not only be equipped to satisfy the requirements for ADS-B Out, but the GTN can also support the display of advanced ADS-B traffic features and subscription-free weather information in U.S. airspace via ADS-B In. Advanced traffic features include TargetTrend™ relative motion technology to better display the trend of traffic relative to the aircraft’s direction of flight. This technology allows the pilot to more easily understand other potential converging aircraft. SURF technology is also available, which supports the display of ADS-B-equipped surface targets on Garmin SafeTaxi® airport diagrams including taxiing aircraft and ground vehicles. When there are several traffic targets in an area, the GTN will declutter the display by grouping the targets and showing only the one that is the highest priority. The GTN also allows the pilot to touch any target on the display to view more detailed information including closure rate and ground speed. The GTN can now display worldwide weather that informs pilots of METARs, TAFs and winds aloft around the globe, with an optional GSR 56 transceiver. Radar and satellite imagery are also available through this service for the United States, Southern Canada, Western Europe and Australia. In addition, the GTN can support voice and data services that let the pilot make worldwide phone calls, send text messages and send email via SMS from the airplane’s cockpit using the GTN as the dialing and messaging interface. For those who have both a GTN and a WAAS GNS 430W/530W product in their cockpit, they can now share information through the new data cross fill capability, minimizing duplication of data loading efforts. This feature allows for the transfer of the recognized legs from the GTN’s active flight plan to the GNS, as well as manual transfer of user waypoints in both directions between the GTN and GNS. The GTN interface now supports Telligence Voice Command and 3D Audio capabilities, enabled by the GMA 35 remote audio panel. Telligence, Garmin’s exclusive speech recognition technology, allows the pilot to activate audio panel functions in response to spoken commands. For example, by simply pressing a push-to-command button on the yoke and saying “Comm One,” the pilot can select the radio, without lifting a finger from the controls. With 3D Audio, incoming audio is spatially separated to mimic the way people process sounds and conversations. This allows pilots to focus their listening attention on a single talker among a mixture of other conversations and background noises. The GTN 750 series comes with a trial version of Garmin FliteCharts (U.S. only) that allow the pilot to quickly view departure procedures, Standard Terminal Arrival Routes (STARs), approach plates and airport diagrams. With the latest GTN software update, Garmin FliteCharts can be geo-referenced to easily track the pilot’s position with a dynamic aircraft symbol overlaid right on the moving map and the dedicated charts page. The latest GTN software release also incorporates several other improvements such as the ability to graphically edit direct-to legs, the ability to sort airway exit points geographically, bigger, bolder, and relevant airspace with the Smart Airspace feature, the ability to toggle off and on certain European airspaces and TCAD traffic display. For current GTN owners, the free software upgrade will be available in Q4 2012 from Garmin Authorized Dealers (installation charges may apply). An upgrade to GNS version 5.0 software is required for enabling GNS-specific features.